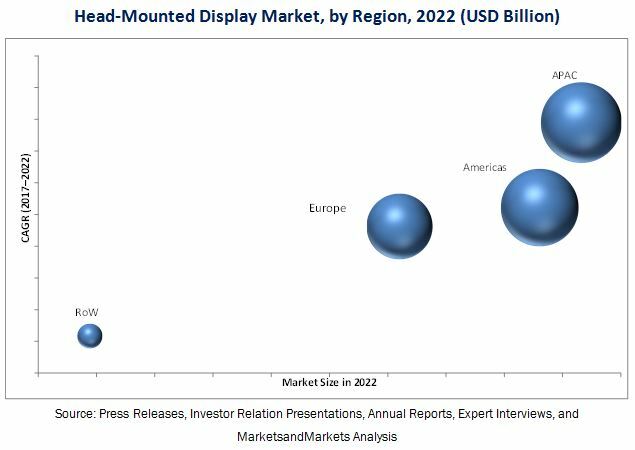 [192 Pages Report] The Head-Mounted Display market was valued at USD 3.25 Billion in 2016 and is expected to reach USD 25.01 Billion by 2022, at a CAGR of 38.8% during the forecast period. The base year considered for the study is 2016, and the forecast period considered is 2017–2022. This report provides a detailed analysis of the HMD market based on HMD type, component, connectivity, product type, application, technology, and region. The report forecasts the market size, in terms of value, for various segments with regard to 4 main regions—Americas, Europe, APAC, and RoW. It also provides the market size in terms of volume for the technology segment. It strategically profiles the key players and comprehensively analyzes their market rankings and core competencies, along detailing the competitive landscape for the market leaders. The research methodology used to estimate and forecast the Head-Mounted Display market begins with capturing data on key vendor revenues through secondary research. Secondary sources used for this research study include government sources, corporate filings (such as annual reports, investor presentations, and financial statements), and trade, business, and professional associations. The bottom-up procedure has been employed to arrive at the overall size of the HMD market from the revenues of key players in the market. 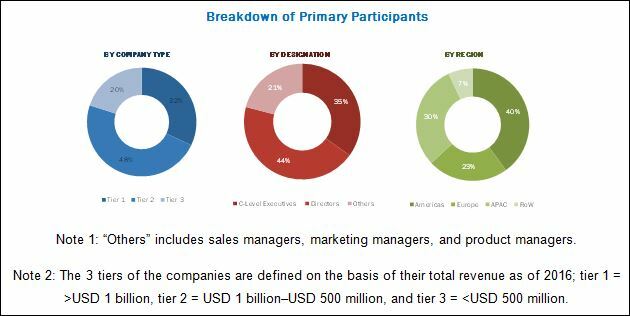 After arriving at the overall market size, the total market has been split into several segments and subsegments, which have been verified through primary research by conducting extensive interviews with people holding key positions in the industry such as CEOs, VPs, directors, and executives. The data triangulation and market breakdown procedures have been employed to complete the overall market engineering process and arrive at the exact statistics for all segments and subsegments. The breakdown of the profiles of primary respondents has been depicted in the below figure. The HMD market comprises suppliers, manufacturers, investors, and distributors. Players operating in the HMD market include Samsung Electronics Co., Ltd. (South Korea), Sony Corporation (Japan), HTC Corporation (Taiwan), Microsoft Corporation (US), Oculus VR, LLC (US), Seiko Epson Corporation (Japan), Google Inc. (US), Kopin Corporation (US), BAE Systems, Inc. (US), Osterhout Design Group (US), Recon Instruments, Inc. (Canada), Rockwell Collins, Inc. (US), Sensics, Inc. (US), Thales Visionix, Inc. (US), and Vuzix Corporation (US). This research report categorizes the HMD market on the basis of HMD type, component, connectivity, product type, application, technology, and region. The HMD market is expected to be valued at USD 25.01 Billion by 2022, growing at a CAGR of 38.8% between 2017 and 2022. The growth of this market can be attributed to the increasing demand for lightweight HMDs, adoption of AR and VR technologies owing to technological advancements, and increasing patent portfolio. This report segments the HMD market based on HMD type, component, connectivity, product type, application, technology, and region. Display plays a vital role in HMD devices. HMDs drive the demand for consumer application because of technological advancements in display technologies, which nowadays offer advanced vision in addition to features such as high-resolution images and 3D viewing. Display has a high impact in making headsets more efficient. It is one of the basic components in headsets, and its decreasing cost is expected to boost the market for HMDs. The HMD market, on the basis of connectivity, has been segmented into wired and wireless. The market for wireless HMD is expected to grow at highest rate during the forecast period as it does not require connectivity with the PC. Therefore, users have the freedom to travel as they can independently move to experience the real and virtual world. The companies are growing majorly in wireless connectivity products such as Microsoft HoloLens, ODG Smart Glasses, and Google Daydream View. The HMD market is moving toward wireless connectivity owing to design improvement and cost-effectiveness. The HMD market based on product type has been segmented into head mounted and eyewear. The market for eyewear is expected to grow at the highest CAGR between 2017 and 2022. Increasing use of eyewear in various applications, such as industry and enterprise, medical, and research and design, is expected to increase the market for eyewear HMDs. Eyewear will also be used in the consumer application with growing adoption. The HMD market based on technology has been segmented into augmented reality and virtual reality. Virtual reality technology led the HMD market in 2016. Availability of low-cost VR headsets, such as Samsung Gear VR and Google Daydream View, is helping to spur the growth of the market. The increasing number of players entering in the market with offerings of headsets at low cost is one of the major reasons behind the wide adoption of VR headsets in this market. The HMD market, on the basis of application, has been segmented into consumer; commercial; enterprise and industry; engineering and design; military, defense, and aerospace; medical; education; and others. The use of VR headsets has been increasing in the gaming application because of their lightweight. VR headsets are available for playing 3D games and are suitable for entertainment applications. Therefore, the consumer application is expected to continue to lead the market for VR headsets. The HMD for enterprise and industry application is expected to grow at a higher CAGR between 2017 and 2022. The HMD market, on the basis of technology, has been segmented into virtual reality and augmented reality. HMDs are gaining wide adoption in gaming and entertainment applications. The large number of players entering the market with low-cost HMDs is one of the major driving factors for the market. APAC is expected to hold the largest share of the HMD market during the forecast period. Increasing adoption of AR and VR technologies in China, Japan, Australia, and India is one of the reasons behind the growth of the HMD market in APAC. The government support to invest in emerging technologies such as virtual reality; potential for education segment to adopt HMDs in China; and wide acceptance of Sony PlayStation VR in Japan are opportunities for this market in APAC. Increasing importance of HMDs in applications such as enterprise and industry, engineering and design, medical, commercial, and education is set to boost the market in APAC. Lack of standardization for HMD design and limited battery life are restraining the growth of the HMD market. Major players in this market, such as Samsung Electronics Co., Ltd. (South Korea), Sony Corporation (Japan), HTC Corporation (Taiwan), Oculus VR, LLC (US), and Microsoft Corporation (US), have adopted growth strategies to expand their customer base and enhance their product portfolio. 14.2 Samsung Electronics Co., Ltd.
14.17.2 Beijing Antvr Technology Co., Ltd.
*Details on Business Overview, Products Offered & Services Strategies, Key Relationships, Recent Developments Might Not Be Captured in Case of Unlisted Companies.